BLACK MASS. Scott Cooper makes movies I think I should love. His style, a little loose but still atmospheric and inventive, creates a unified visual identity for the settings of his stories. He then populates these backdrops with boozers, bare knucklers, broken down brothers, speed freaks, murderers and musicians. It's my kind of Americana writ large, and more often than not played out by top-tier actors digging deep to get at a variety of challenging emotional truths. Cooper seems to attract above-the-title talent to his projects and coax especially strong performances out of stars. Jeff Bridges won an Oscar for Crazy Heart (2009) and the cast of Out of the Furnace (2013), including Christian Bale, Casey Affleck, Woody Harrelson and Willem Dafoe, did universally outstanding, occasionally devastating work. In spite of all that, though, I can't quite love the movies. For all their poise and depth they, to a one, lack an element of grubbiness, some necessary and un-washable stain that would make them resonant. They are nearly great, but their proximity to greatness makes their relatively minor shortcomings seem insurmountable. Such, regrettably, is again the case with Black Mass, a gorgeously made, exceptionally cast, tremendously acted crime biopic about which I would like to feel more excited. Johnny Depp plays James "Whitey" Bulger, the South Boston street tough who became a kingpin with a little help from the FBI. The narrative, framed by dramatized police interviews with a number of Bulger's closest associates, picks up in 1975. Bulger has already established himself as someone not to be trifled with, having served time in both Leavenworth and Alcatraz. His younger brother Billy (Benedict Cumberbatch) has meanwhile gotten busy with a political career, eventually landing himself a state Senate seat. From out of the woodwork of the old neighborhood comes John Connolly (Joel Edgerton), boyhood friend of both Bulgers, now out to make a name for himself in the FBI. Connolly brings Bulger in as a confidential informant, enticing him with the opportunity to effectively dismantle the Italian families infringing on his rackets. Bulger supplies a few precious nuggets of information, thereby purchasing himself 20 years of scrutiny-free operations. Those operations entail, of course: robbery, racketeering, blackmail, extortion and more than a little murder. None of this ends particularly well for any of the parties involved, needless to say. (The real life ending to the story has been well documented in the national news these last few years, but I won't spoil it). The central thematic thrust of Black Mass is about loyalty and boys from a rough part of town wanting to make good for themselves and for each other. But somewhere in the perfectly appointed sets and the wide lapels and the Godfather-esque lighting and composition, that theme gets buried and nearly forgotten. It's a beautiful looking movie, with all the details in place, but it ultimately feels more like an exercise in style than a full-blooded story. The acting, per usual with Cooper, is excellent, and Depp takes a refreshing break from the high-wire miscues that have become his recent norm. 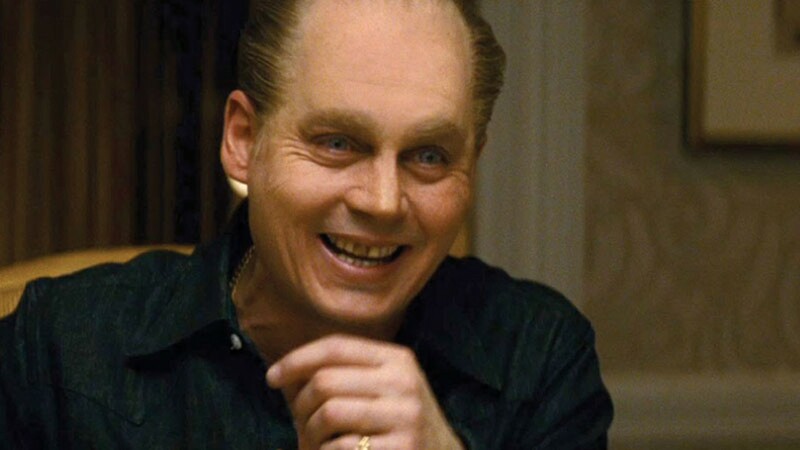 Even though the Bulger makeup occasionally distracts, making Depp look like a scarecrow crossed with a pit bull, he inhabits the role with an enjoyable ferocity. His Bulger is plausible, unsentimental; he might be a psychopath or he might just be exceptionally driven. Edgerton stands out, too, as a man trying to hide his true identity as the snot-nosed kid Jimmy Bulger protected from the bullies all those years ago. His hubris is palpable and tragic in every scene, and it can be tough to decide whether to pity or loathe him. Cumberbatch does customarily fine, if minor, work and David Harbour, as Connolly's FBI co-conspirator John Morris, is especially compelling. As Bulger's rogues' gallery Jesse Plemons, Rory Cochrane and W. Earl Brown give dark, fascinating life to the process of losing faith in someone for whom they would commit multiple murders. GRANDMA. A lot has been said about Lily Tomlin's performance in this one, and rightfully so. She is hilarious, tough and a little heartbreaking; mostly hilarious. She plays Elle, a septuagenarian poet who has recently lost her partner of half a lifetime to cancer. Her career is stalled, she has $43. The same morning she has messily broken up with her new girlfriend (Judy Greer), Elle's granddaughter Sage (Julia Garner) shows up needing $600 to terminate a pregnancy. The movie follows Elle and Sage as they make their way around town, shaking down Sage's idiotic ex-boyfriend, attempting to rebuild a bridge with Elle's long-estranged ex-husband (a wonderfully kooky/deeply sad performance by Sam Elliot), and eventually enlisting the aid of Sage's mom (Marcia Gay Harden), of whom they are both afraid. For showtimes, call: Broadway Cinema 443-3456; Fortuna Theatre 725-2121; Mill Creek Cinema 839-3456; Minor Theatre 822-3456.